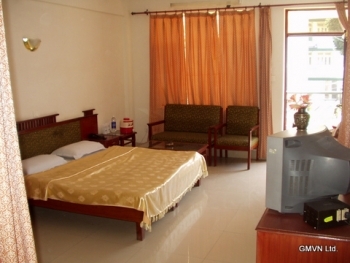 The GMVN Tourist Rest House at Uttarkashi offers standard lodging at affordable price. Vishwanath temple and Maneri dam are popular places to visit. This tourist Bungalow was opened to guests in 1960. 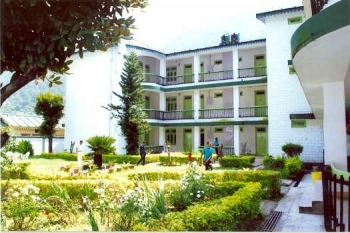 The GMVN Tourist Rest House Uttarkashi has manicured gardens, a peaceful location a bit off the main Gangotri highway. GMVN Tourist Bunglow Uttarkashi is located near Collector Office on Tiloth Road, Â½ km away from Uttarkashi bus stand. Uttarkashi town is situated at a distance of 165kms from Rishikesh. The resort serves 45 rooms in all categorized under family suites (8), super deluxe (7), deluxe rooms (23) and AC rooms (7). Each room is well decorated and has amenities like satellite TV in rooms, attach bathroom, geysers and room service. The tourist bungalow also houses a pure vegetarian restaurant.